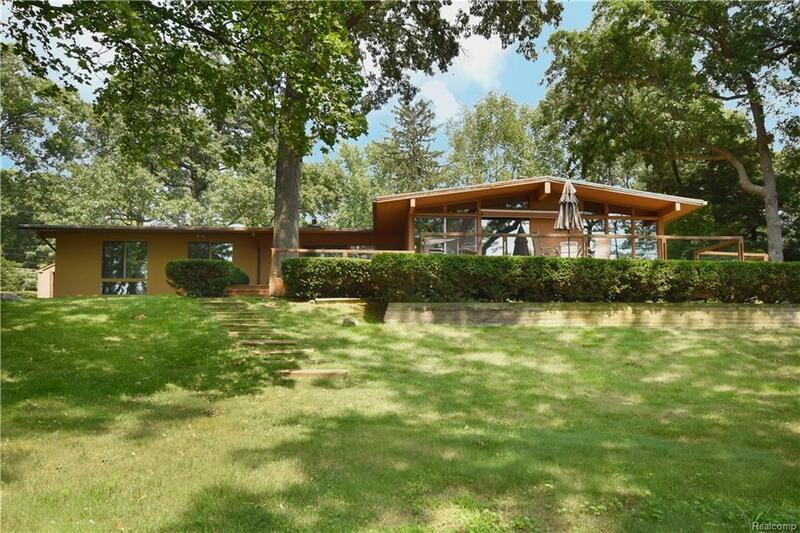 Mid-Century modern gem on one of the best lots on Gilbert Lake. Situated on 1.25 acres with elevated views along with a nicely wooded lot create an "up north feel. Sprawling ranch with open floor plan includes 3 bedrooms (possible 4th with removal of built-ins) and 2.2 bath. Highlighted by floor to ceiling windows, warm woods, built-ins, the sleek interior features an inviting living room with fireplace, formal dining room, classic kitchen looking out to breakfast area & family room. Spacious master bedroom enjoys a large walk-in closet and tiled bath. Two additional bedrooms are located at the front of the home along with full bath, laundry room and bright atrium bringing the outdoors in. Lovely deck expands along the back of the home for beautiful lake views. Bloomfield Hills Schools. 121 ft. of lake frontage.